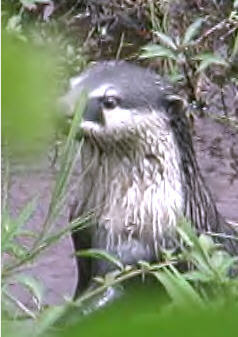 This otter is closely related to the Cape clawless otter and occurrs in central equatorial Africa. It differs from the Cape clawless in that it has silver tips to the ends of its hairs on its neck and head and has dark patches of fur between the eyes and nostrils. It lives exclusively in marshes and shallow margins of lakes. This is the leaste adapted of all the otters to an aquatic way of life as it has short fur providing less insulation. The back feet are only partly webbed and the front have no webbing at all. Diet: earthworms, frogs, freshwater crabs, mud dwelling fish. The Congo Clawless Otter occurs in the Congo river basin in Democratic Republic of Congo, northeastern Angola, Congo, Gabon, southern Cameroon and the extreme southwest of the Central African Republic, as well as the forests and wetland areas of Rwanda, Burundi, and southwestern Uganda. The Congo Clawless otter occurs in rain forests and lowland swamps of the Congo river basin and the extreme southwest of the Central African Republic; as well as the forests and wetland areas of Rwanda, Burundi, and southwestern Uganda. It has recently been recorded from Cross River State in southeastern Nigeria (Rowe-Rowe 1995). 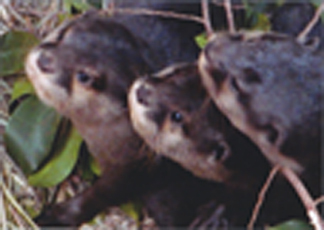 The Congo claw-less otter is the least known of the three African otter species, and no detailed ecological study on this species is believed to have been published (Nel 1998). Throughout Africa otters are killed for skins and meat or because they are regarded as competitors for food, particularly in rural areas where fishing is an important source of income, or where they are believed to be responsible for poultry losses (Rowe-Rowe 1995). Over the years, their habitats have been either drastically changed or lost, following bush clearing, deforestation, overgrazing, siltation, draining of wetlands or water extraction or denudation of riparian vegetation (Rowe-Rowe 1995, Nel and Somers 1998). The survival of otters, as well as most other wildlife in Africa is strongly influenced by human population growth rate, leading to increased competition between human and wildlife (Rowe-Rowe 1995).